Dansk Wilton achieves best possible VOC rating “Indoor Air Comfort GOLD” – the most ambitious low-emitting label in whole Europe. 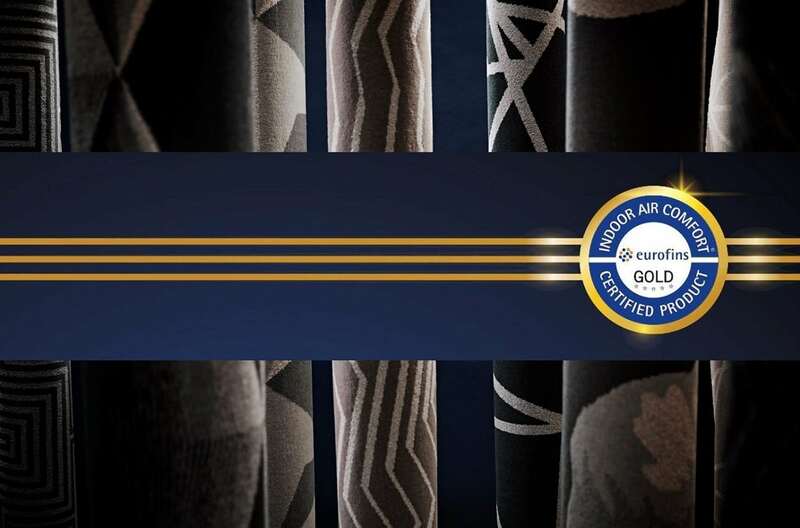 All Axminster and Colortec carpets from Dansk Wilton have been tested and awarded the “Indoor Air Comfort GOLD” rating for their very low VOC (Volatile Organic Compounds) emission levels. Most people spend more than 80% of their time indoors. While this is mainly an issue of proper ventilation, which is not always realized in energy efficient buildings, another important element of indoor air quality is pollution – from surrounding outside air, and from products and materials used indoors. Specifications on low VOC emissions from products into indoor air intend to improve indoor air quality by encouraging use of low-emitting products. Carpets from Dansk Wilton naturally absorb and filter airborne VOCs – unwanted toxins and odours that can cause irritation to humans. Wool carpets bind the allergy-causing substances tightly. Tests showed that indoor air in a carpeted room contained less than half the amount of fine particulate dust than the smooth floors. Some of the common sources of negative VOC’s in the indoor environments are adhesives, caulking compounds, chemicals and other substances used in the production of common carpets. This label combines all relevant European regulations and most of the voluntary labels on VOC emissions from products – just by copying together the most stringent requirements in any EU country into one label. This makes Indoor Air Comfort GOLD the most ambitious low-emitting label in whole Europe. Choosing a product classified as “Indoor Air Comfort GOLD” leads to improved indoor air quality as it emits very few or even no VOCs. A “Indoor Air Comfort GOLD” certified product can help achieving points in both LEED and BREEAM certifications of buildings. Further information on this can be found in this presentation from GREENBUILD International Conference and Expo: “Identification of low‐emitting interior products for LEED and BREEAM”. total volatile organic compounds (TVOC), formaldehyde, acetaldehyde, toluene, tetrachlorethylene, ethylbenzene, xylene, styrene, 2-butoxyethanol, 1,2,4-trimethylbenzene and 1,4-dichlorobenzene. Require the complete test reports of Dansk Wilton Colortec and Axminster Carpets by filling in this contact form. Find further information on “Indoor Air Comfort” on the website of Eurofins.